Predator is a character who has bested the likes of Xenomorphs and Carl Weathers. He's gone toe-to-toe with Arnold Schwarzenegger and even been the subject of a musical. None of those accomplishments come close to preparing him for what's next. Dark Horse and Archie Comics are offering a glimpse of his next big challenge in Archie Meets Predator, written by Alex de Campi and illustrated by Fernando Ruiz. Archie and friends hit Costa Rica for spring break, where party and beach games soon get replaced by the most dangerous game. What mysterious attraction does the gang hold for the trophy-collecting Predator, and will the kids even realize they’re in danger before it claims them all? Archie Comics and Dark Horse Comics team up for a bloodbath in Riverdale! NEW YORK, NY—America’s favorite teen meets the galaxy’s fiercest hunter! 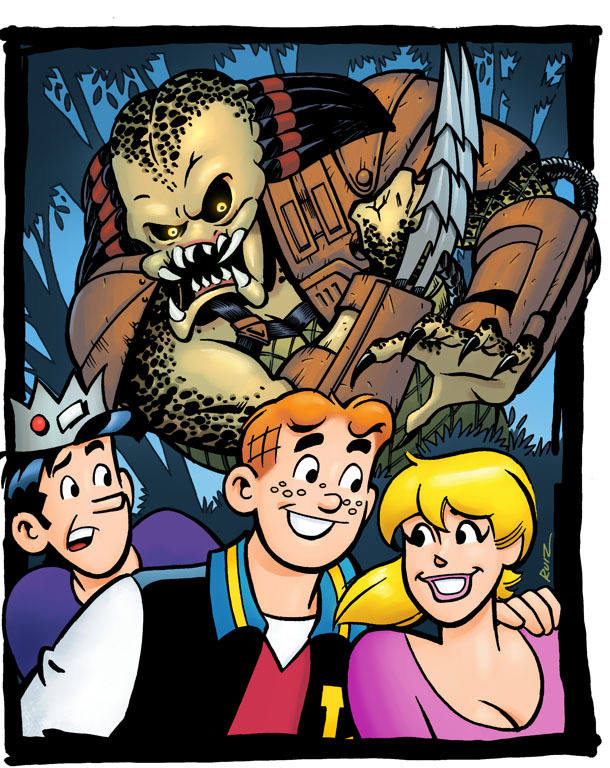 Archie Comics and Dark Horse Comics are proud to bring you spring 2015’s hottest crossover: ARCHIE MEETS PREDATOR. For more information and for all the latest breaking news from New York Comic Con 2014, head to the official Archie Comics News Blog!